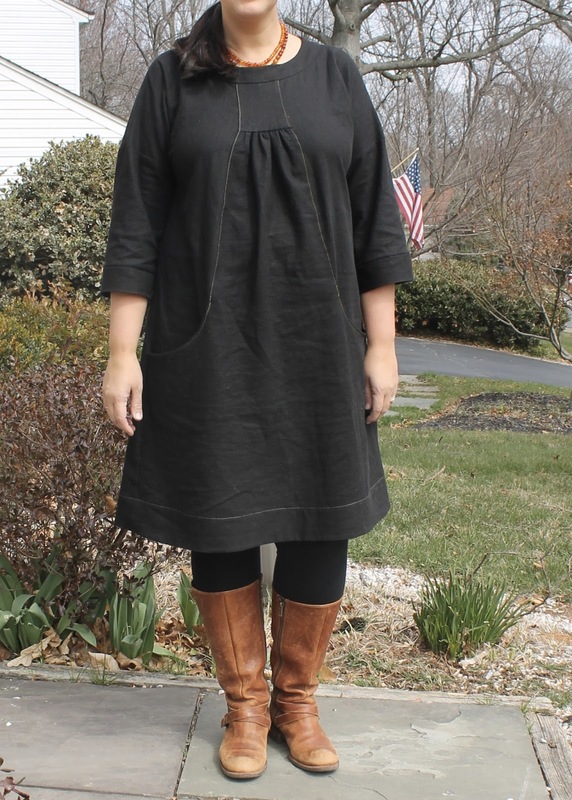 In case you are not aware, this is the Lisette Portfolio dress, aka Simplicity 2245, which has been out of print for several years and has attained a bit of a following. I bought it while it was still widely available, even though I wasn't at all a fan of it at the time. I have no idea why I bought it. But when I happened upon the unopened pattern envelope in my bin a few months ago, suddenly I was in love. Where I used to gravitate towards lower-cut dresses, now I'm more comfortable in a neckline that doesn't gape when I lean over to pick up a toy train. Where I used to rock a tight top, now I'm self-conscious in anything without ease around the middle to skim over my stomach. Part of it is that I've had a bunch of babies in the last seven years, and the rest of it is probably just time ticking by, and my age with it. My style has been changing for awhile, I guess, but my newfound love for this pattern really crystallized that for me. So all this is to say, that I finally pulled out the pattern in mid-March and started muslining. As I was planning my dress, I carefully considered how I wanted it to fit me. I looked at just about ever Portfolio dress ever shared on line and thought about what made the good ones work, and what I didn't like about some of the others. Two things jumped out at me. First, I had to make sure that the center gathered panel started at the right place on my bust. If the gathering started too high, it would make the bust appear lower and create too much volume. Second, I knew there was a chance the neckline would be too high. Some of my not-so-favorite versions out there on the web had necklines that looked like they were about to strangle the wearer. Redrafting it and keeping the same width would be a significant amount of work that I'd rather not mess with. I know a lot of people have just left off the neckband, but I think that makes the neckline a bit too wide. So I steeled myself for some significant neckline redrafting, but I was pleasantly surprised when the neckline on the muslin came out fine. I did end up sewing the upper neckline on my final dress with a 7/8" seam allowance to lower it 1/4", but it would have been ok the way it was drafted, too. For my muslin, I traced off the size 14 with my customary 1/2" forward shoulder adjustment. To increase the width necessary for my bust and hips, I cut the center front panel 1.25" off the fold, adding a total of 2.5" from the bust down. I also sewed my side seams at 3/8" to get an extra 1" of ease. When I cut my back pattern piece, I graded out to an 18 from the bust down to the hem to make a little extra waist and hip room. I left the yoke as is on the first go-round, but ended up trying two variations in the muslin stage - one where I lengthened the yoke 1", and the other 2". I found that 1" was just right. Making a muslin was crucial for this pattern - I discovered that I needed more room in the sleeves and that I needed more length in the dress overall. When my Google search for a cut-on sleeve full bicep adjustment tutorial struck out, I asked on Instagram. (I clearly need to buy a fitting book or two). Thanks to advice there, I ended up altering the top of the sleeve, starting from 0 at the neckline (since the neckline fit me well) and widening to 5/8" at the end of the drop shoulder. Then I had to add that width to the bottom sleeve piece, which ended up being about a size 20. Cut size 14, but graded back pattern out from 14 at bust to 18 line at hem. Graduated back seam to a 1/4" seam from just above the booty down to the hem. Cut front panel 1.25" off the fold for a total of 2.5" width added. Lengthened dress 2.25" (And somehow this was still too short; I ended up sewing on a hem facing with a quarter inch seam to preserve the length). Lengthened yoke 1" and shortened front panel 1" to correspond. Sewed side seams at 3/8" to add a total of 1" circumference. 1/2" forward shoulder adjustment (though I am finding in the finished dress that I actually need to move the shoulder seam back to its original location, at least where it hits the neckline, if not the whole way through). Added width to drop shoulder by adding a wedge to both front and back that was 5/8" wide at bottom of shoulder and 0" at neckline. Added 5/8" to each side of sleeve piece. Cut larger bottom band (15.25" wide). Sewed tops of neckband and neckband facing together with a 7/8" seam to lower neckline by 1/4". I.am.thrilled.with.this.dress. It fits me almost perfectly. It is very comfortable and easy to wear. I really like the a-line skirt shape, which holds itself nicely in this full-bodied linen. I have already tried it on with nearly all my shoes and cardigans. It feels like a super-versatile wardrobe piece. 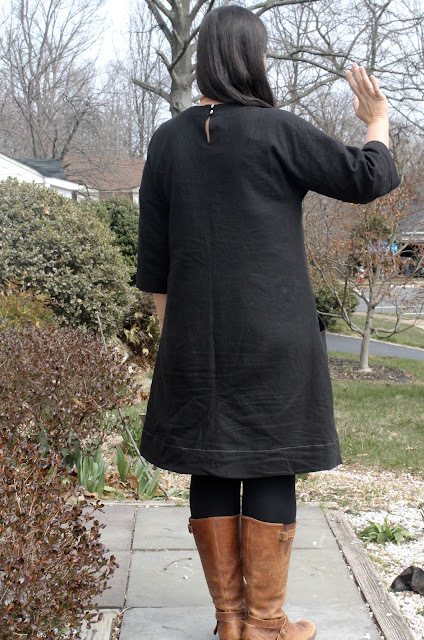 It can be casual with sandals, dressed up with heels and a cardigan, cozied up with boots (though the sleeves are wide enough that I don't have any cardigans that fit well over it - something that will need to be remedied at some point). The possibilities are endless. There are a couple of small issues that have presented themselves in my final version. First, as I mentioned above, I need to undo my forward shoulder adjustment, at least partly. Second, there is just a slight bit of gaping at the front neckband. I didn't have this issue in my muslin, but I also didn't put on the neckband facing or lower the neckline in my muslin. To address this issue on a possible future Portfolio, I'd need to take a 1/4-3/8" wedge out of the center front of the front neckband piece. 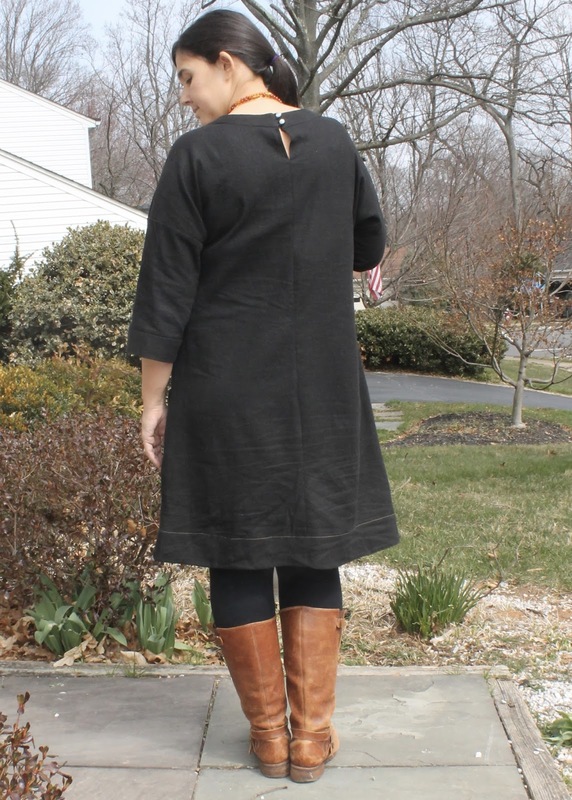 Third, I see in the photos of the back view of the dress, that I do need a smidge more room around my backside. I think that adding just a bit of width to the center back seam will help. And I am very tempted to make a second Portfolio. 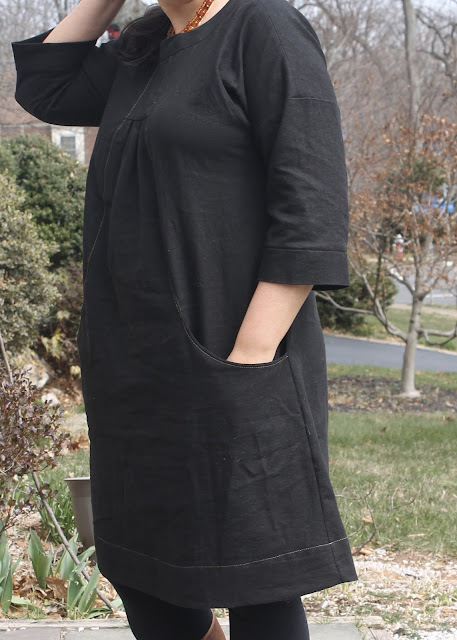 This dress used 3.25 yards of fabric - a lovely black linen that I got for a steal back in February - $7.20 for 4 5/8 yards - during a Fabric Mart sale. I topstitched the pockets and the side-front seams up to the yoke using dark gold thread. I also decided to topstitch the hem facing with the same gold thread. As I was doing it I was not sure it was worth the effort, but it's definitely visible in the photos and I like the extra touch. I like the look of the back loop closure, though I can pull this dress on without unbuttoning it, so it's not at all necessary. Yes, that's snow in the above photo. All the photos in this post were taken within five days of each other. Our weather has been crazy! I don't have immediate plans to sew up another one, as I don't have any suitable cuts of fabric large enough in my stash. But I'm thinking a short-sleeved linen one in a bright color would be a great addition to my summer wardrobe, so I may revisit this in a few months. I can see why it will become a favorite - just put on and leave, it looks put together and so comfy! I like the design of that dress, especially the pockets. It looks great on you! This is an awesome dress. I even googled images of this pattern after seeing your teaser post about it last week to see if it would be worth running down a version on ebay or etsy. (I ultimately decided that my carson dress purchase will be a better fit for me. At least I hope so!) But this looks great on you! I really love that silhouette--I'm hoping the carson will be "that" dress for me. I actually don't think you need any more room in the back--it looks like a spot-on fit to me. What a wonderful wardrobe staple! I love it when something works out like that. Your Portfolio looks so gorgeous one you. All of the muslining and fitting was worth it! So pretty! I have this pattern but haven't sewn it up because I'm not a fan of high necks on me (like some of the ones online) but yours is just right!